all those daring expeditions of traders and missionaries up the Ottawa, to Georgian Bay, to the headwaters of the Mississippi and elsewhere into the unexplored land of the forest, the iurbearing animal and the Indian. seat of local government and the most historic city in Canada. Se,e Quebec, Past and Present, by Sir J. M. Lemoine; Picturesque Quebec; Sketch of, the Province by Honoré Mercier; and Cassell's Picturesque Canada, edited by Principal Grant. Quebec, capital of the province of that name, stands on a steep promontory of the St. Lawrence at its junction with St. Charles River, 300 miles from the Gulf of St. Lawrence and 180 below Montreal. Quebec is the most important military position in Canada. The citadel occupies an area of 40 acres and commands a magnificent view. The harbor is spacious, and the docks and tidal basin are perfect specimens of engineering skill. The city is divided into an upper and a lower town. the water, commanding a noble ! iew. Three handsome modern gates have replaced the old gates. The principal buildings are the courthouse, postorhce, custom-house, city-hall, masonic hall, basilica, archepiscopal palace, Anglican cathedral, Church Hall, Young Men's Christian Association building and the parliamentary and department buildings. 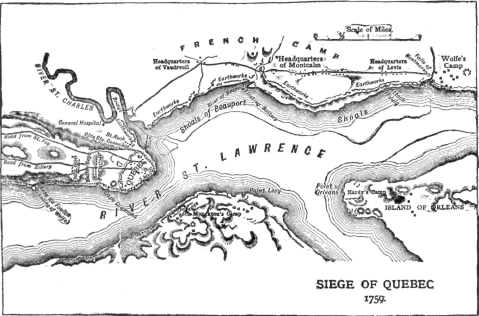 Quebec is connected with all cities in America by lines of railroad, and on the St. Lawrence is, with Montreal, at the head of ocean-steamship navigation to Europe. Population 68,840. Consult G. Mercer Adam's Illustrated Quebec.